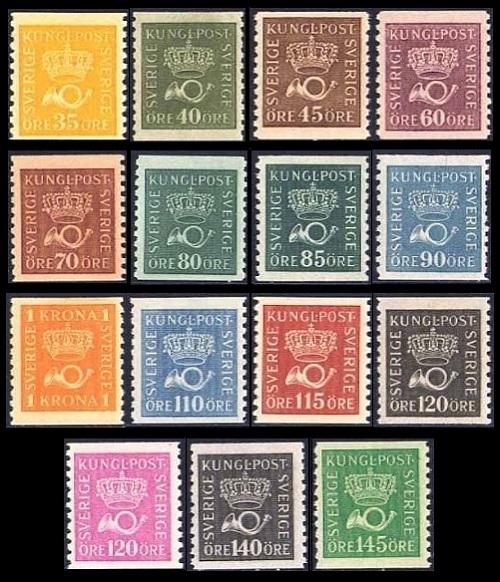 The definitive stamps of Sweden, for the period between 1920 and 1936, saw four new definitive postage stamp series and the appearance of Sweden's first official coil-format stamps. By the end of this period, virtually ALL Swedish definitive postage stamps were being produced in either horizontal coil-format (perforated vertically) or in booklet format (perforated all around). 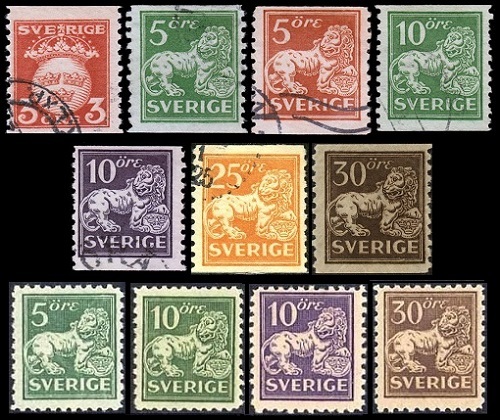 The eleven Coat-of-Arms and Heraldic Lion major-type definitive stamps of Sweden shown above were issued between 1920 and 1925. The stamps are all engraved. The two designs feature a Crowned Coat-of-Arms and a Heraldic Lion supporting the Coat-of-Arms of Sweden. 03 Ö. (1920 - Sc. #115) - Copper Red. 05 Ö. (1925 - Sc. #116) - Green. 05 Ö. (1921 - Sc. #117) - Copper Red. 10 Ö. (1921 - Sc. #118) - Green. 10 Ö. (1925 - Sc. #119) - Violet. 25 Ö. (1921 - Sc. #120) - Orange. 30 Ö. (1920 - Sc. #121) - Brown. 05 Ö. (1920 - Sc. #122) - Green. 05 Ö. (1921 - Sc. #123) - Copper Red. 10 Ö. (1921 - Sc. #124) - Green. 30 Ö. (1920 - Sc. #125) - Brown. 05 Ö. (1920 - Sc. #126) - Green. 10 Ö. (1921 - Sc. #127) - Green. 10 Ö. (1925 - Sc. #128) - Violet. 30 Ö. (1920 - Sc. #129) - Brown. 05 Ö. (1920 - Sc. #130) - Green. 10 Ö. (1921 - Sc. #131) - Green. 05 Ö. (1925 - Sc. #132) - Green. 05 Ö. (1921 - Sc. #133) - Copper Red. 10 Ö. (1926 - Sc. #134) - Violet. 05 Ö. (1925 - Sc. #135) - Green. 05 Ö. (1922 - Sc. #136) - Copper Red. 10 Ö. (1924 - Sc. #137) - Green. 10 Ö. (1925 - Sc. #138) - Violet. 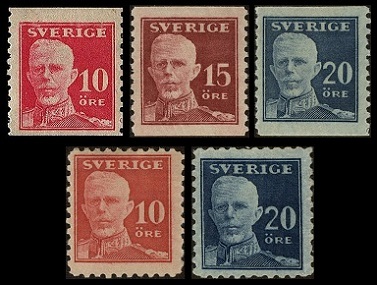 The five Portrait major-type definitive stamps of Sweden shown above were issued between 1920 and 1921. The stamps are all engraved. The common design features a facing portrait of King Gustaf V.
10 Ö. (1920 - Sc. #139) - Rose. 15 Ö. (1920 - Sc. #140) - Claret. 20 Ö. (1925 - Sc. #141) - Blue. 10 Ö. (1920 - Sc. #142) - Rose. 20 Ö. (1921 - Sc. #143) - Blue. 20 Ö. (1920 - Sc. #144) - Blue. 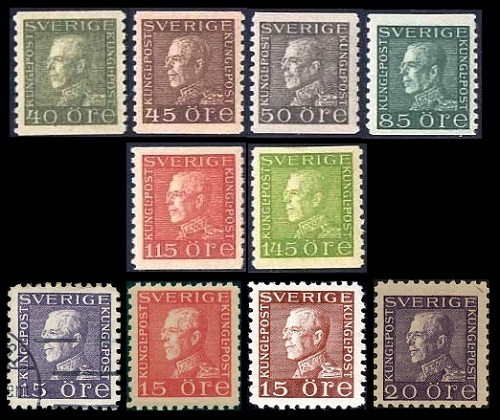 The fifteen major-type definitive stamps of Sweden shown above were issued between 1920 and 1934. The stamps are all engraved. The common design features a Crown and Posthorn. 035 Ö. (1922 - Sc. #145) - Yellow. 040 Ö. (1920 - Sc. #146) - Olive Green. 045 Ö. (1922 - Sc. #147) - Brown. 060 Ö. (1920 - Sc. #148) - Claret. 070 Ö. (1922 - Sc. #149) - Red Brown. 080 Ö. (1920 - Sc. #150) - Deep Green. 085 Ö. (1929 - Sc. #151) - Myrtle Green. 090 Ö. (1925 - Sc. #152) - Light Blue. 001 K. (1921 - Sc. #153) - Deep Orange. 110 Ö. (1920 - Sc. #154) - Ultramarine. 115 Ö. (1929 - Sc. #155) - Red Brown. 120 Ö. (1922 - Sc. #156) - Gray Black. 120 Ö. (1933 - Sc. #157) - Lilac Rose. 140 Ö. (1920 - Sc. #158) - Gray Black. 145 Ö. (1930 - Sc. #159) - Bright Green. 035 Ö. (1923 - Sc. #160) - Yellow. 060 Ö. (1920 - Sc. #161) - Red Violet. 080 Ö. (1920 - Sc. #162) - Blue Green. 110 Ö. (1920 - Sc. #163) - Ultramarine. 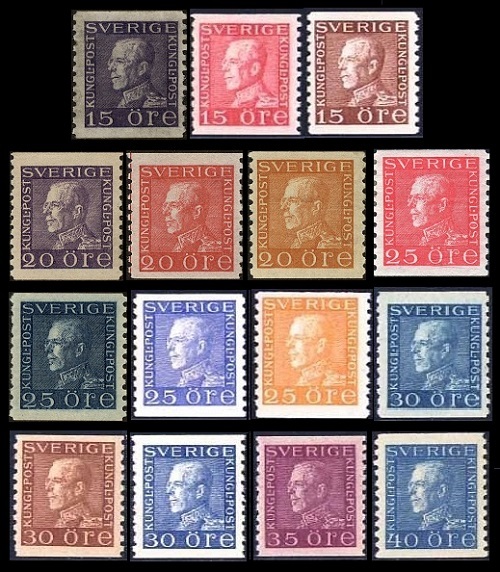 The twenty-five major-type definitive stamps of Sweden shown above were issued between 1921 and 1936. The stamps are all engraved. There are actually not that many denominations in this series. Due to the fact that this series was issued over such a long period of time, there was a need for major color changes, causing duplication of many of the denominations. The common design features a left-facing portrait of King Gustaf V.
015 Ö. (1922 - Sc. #167) - Violet. 015 Ö. (1928 - Sc. #168) - Rose. 015 Ö. (1936 - Sc. #169) - Brown. 020 Ö. (1921 - Sc. #170) - Violet. 020 Ö. (1922 - Sc. #171) - Rose. 020 Ö. (1925 - Sc. #172) - Orange. 025 Ö. (1922 - Sc. #174) - Rose Red. 025 Ö. (1925 - Sc. #175) - Dark Blue. 025 Ö. (1934 - Sc. #176) - Ultramarine. 025 Ö. (1936 - Sc. #177) - Yellow Orange. 030 Ö. (1923 - Sc. #178) - Blue. 030 Ö. (1925 - Sc. #179) - Brown. 030 Ö. (1936 - Sc. #180) - Light Ultramarine. 035 Ö. (1930 - Sc. #181) - Red Violet. 040 Ö. (1921 - Sc. #182) - Blue. 040 Ö. (1929 - Sc. #183) - Olive Green. 045 Ö. (1929 - Sc. #184) - Brown. 050 Ö. (1921 - Sc. #185) - Gray. 085 Ö. (1925 - Sc. #186) - Myrtle Green. 115 Ö. (1925 - Sc. #187) - Brown Red. 145 Ö. (1925 - Sc. #188) - Apple Green. 015 Ö. (1922 - Sc. #189) - Violet. 020 Ö. (1921 - Sc. #189A) - Violet. 015 Ö. (1925 - Sc. #191) - Rose Red. 015 Ö. (1936 - Sc. #192) - Brown. 020 Ö. (1922 - Sc. #193) - Violet. One paper watermark was used during this period. It is shown above. The 5 Kronor pictorial definitive stamp of Sweden shown above (Sc. #229) was issued on November 26, 1931. The stamp is printed on unwatermarked paper, and it is perforated 10. The design features the Royal Palace in Stockholm.